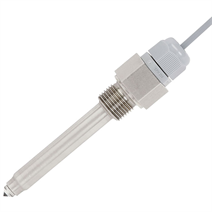 The model OLS-C02 optoelectronic level switch is used for monitoring the level of liquids. The optoelectronic sensor consists of an infrared LED and a light receptor. The model OLS-C02 level switch offers the advantage that its switch length is selectable. This enables an optimal adaptation to the application-specific requirements.